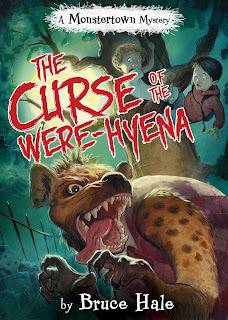 The Full Moon of the Were-Hyena is still in full swing! 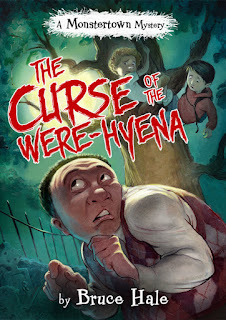 I am, of course, referring to the release of the awesomely-scary-but-still-hilarious book, The Curse of the Were-Hyena which I reviewed back here. 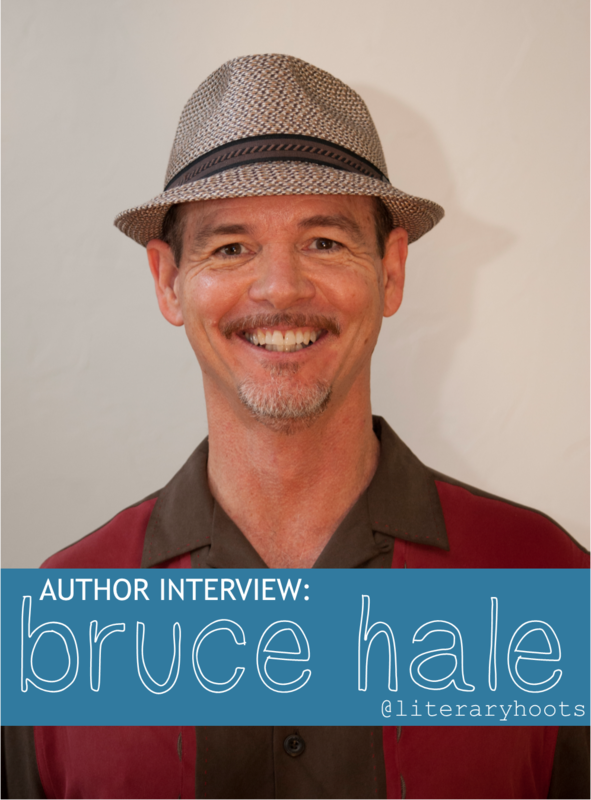 AND I'm so pleased to share an interview with the author of the book, Mr. Bruce Hale. Read on to learn more about the book, his Hemingway Technique, and the name of that rather dashing hat. E: Hi Bruce! Thanks for doing this interview. Let's talk about the book: you've mentioned that the original idea came from a story you illustrated in 2nd grade, but a were-hyena?? That seems pretty unique! Tell us more about the idea behind the story and deciding to have a were-hyena be your star monster. Any special research go into it? B: My second-grade story was called “The Two Brothers in Monstertown,” and it was basically these two boys meeting and fighting various monsters, including my favorites at that time, Wolf-Man and Frankenstein’s Monster. For years, I would show that original book in my author visits, and for years, kids would tell me, “You should turn that into a real book.” I tried a few times to make a rhyming picture book out of the concept, but it just wouldn’t fly. Then, on one California school visit, a kid told me, “You should make it a mystery series, with kids solving mysteries that have to do with monsters.” Bingo! As I mulled over the idea while visiting more California schools, it struck me that the Latino kids I spent time with there don’t have that many representations of themselves in the kind of books I write. That led me to making Carlos a Latino main character. A were-shark sounds even more terrifying! If you could shape-shift into any animal, which would you choose? I’d have to say a dolphin. I see them fairly regularly on my beach walks in Santa Barbara, and I just love the way they glide and play through the water. Mr. Chu is a pretty awesome teacher (pre-bite, of course). Did you have a favorite teacher growing up? What traits make for a great teacher? One of the real standouts was my fourth-grade teacher, Miss Porter. She was the first to really encourage both my reading and my creative writing at a time when I wasn’t confident about either. I think excellent teachers are like wood carvers in a way—they see the shape that is wanting to emerge from the raw wood and do their best to help make that happen. Excellent teachers transmit their own enthusiasm in such a way that it’s contagious. Students catch it from them and then follow their own passions. How did you become a children's book author? When did you first decide to give it a try? While living in Honolulu, I’d started a side business with a friend making stuffed toys covered in aloha-print fabric. Our gecko toy was really popular, and I’d always kind of wanted to create a picture book, so in 1989 I self-published Legend of the Laughing Gecko as a companion piece to the toy. It really took off, and I discovered I loved the process, so I decided to write more books. After publishing and promoting five books with this gecko character, I gave up on self-publishing more titles and decided to let another publisher do all that hard work of book design, printing, editing, and so forth. What sorts of things get your creative juices flowing when it comes to writing? Any special writing techniques? The above-mentioned beach walks definitely help, as does regular exercise of any sort. Of course, chocolate chip cookies work really well as a reward for meeting daily writing goals (and a reason to keep exercising!). As for technique, I like to have a plot roughed out before I start writing. It doesn’t need to be complete; it just needs to provide a guide. I write my first draft as quickly and sloppily as possible, trying to capture thoughts and inspirations. And at the end of each writing session, I use the Hemingway Technique. No, not drinking heavily and starting a fight, but leaving a sentence unfinished, so that it’s easier to start up again the following day. According to your homepage, you've traveled a lot! Do you have a favorite place? How about a favorite travel-related memory? Ooh, hard question. I like different places for different reasons, but the memory that popped into my mind first was a trip to Bhutan about eight years ago. It was a remarkable place—isolated, lovely, and with such good-natured people. A real highlight of the trip was hiking up and up this sheer cliff-face to visit the Tiger’s Nest, a temple perched way up on the side of a mountain. That such a beautiful, spiritual place could exist in such a tenuous position really captured my imagination. Favorite style of hat? Trilby. It’s basically a shorter-brimmed fedora, and you can see a picture of it on the Bruce’s Hat Club for Men page of my www.brucehale.com website. Favorite comic book character? Calvin and Hobbes. Or if you’re talking superheroes, Spider-Man. Favorite thing to do in your spare time? Make music. I’m the lead singer for a salsa band called Mezcal Martini, which is great fun. Chocolate or vanilla? Chocolate all the way. Awesome, thanks again for doing this interview, Bruce! 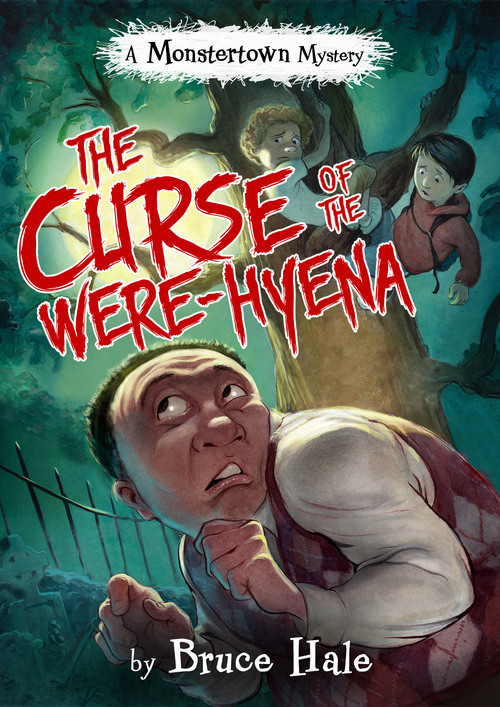 Edgar-nominated author Bruce Hale is passionate about inspiring reluctant readers to read. He has written or illustrated more than 35 seriously funny books for children, including the popular School for S.P.I.E.S. and Chet Gecko Mysteries series; as well as picture books such as Clark the Shark, Snoring Beauty, and Big Bad Baby. An actor and a Fulbright Scholar in Storytelling, Bruce is in demand as a speaker, having presented at conferences, universities, and schools around the world. Bruce's book The Malted Falcon was an Edgar Award Finalist and Murder, My Tweet won the Little D Award for Humor Writing. He lives in Santa Barbara, California with his wife and dog. Connect with him on Twitter and Facebook. And don't forget to check out the free discussion guide and activities to go with his new book!